Thank you to Bookmasters for sending me this book to review! 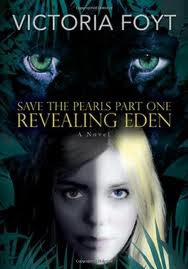 In a post-apocalyptic world where resistance to an overheated environment defines class and beauty, Eden Newman's white skin brands her as a member of the lowest social class, the weak and ugly Pearls. Doomed unless she mates soon, Eden hopes a Coal from the dark-skinned ruling class will save her. But when she unwittingly compromises her father's secret biological experiment, perhaps mankind's only hope, Eden is cast out-into the last patch of rainforest and into the arms of a powerful beast-man she believes is her enemy, despite her overwhelming attraction to him. To survive, Eden must change-but only if she can redefine her ideas of beauty-and of love. Along the way, she receives some beautiful insight from her virtually adopted aunt Emily Dickinson. This book is entertaining. Very entertaining. And it's got a really addictive love story. I enjoyed reading this book from beginning to end. The plot is interesting and compelling. Make no mistake, this is a fun read. But I think the entire story is severly underdeveloped and reads more like a Napoleon Dynamite-esque daydream fantasy instead of a really killer dystopian. I really wanted to know more about the underground world that Eden grew up in, I was never really able to paint a solid mental picture of the place. I wanted more ties back to that world and what had gone wrong in the outside world, overall, I just wanted more development. Also, I wanted less sexuality. A lot less. This is a book meant for young adult readers. Sure, teens are hormonal, but I'm not a supporter of feeding that frenzy. At. All. If you're looking for a breezy, light romance/fantasy, this is a perfectly adequate easy read. If you're looking for the next Hunger Games, keep looking.